It is believed that the most fortunate alone get an opportunity to journey to Kailash-Manasarovar, the abode of Lord Shiva and Goddess Parvati. 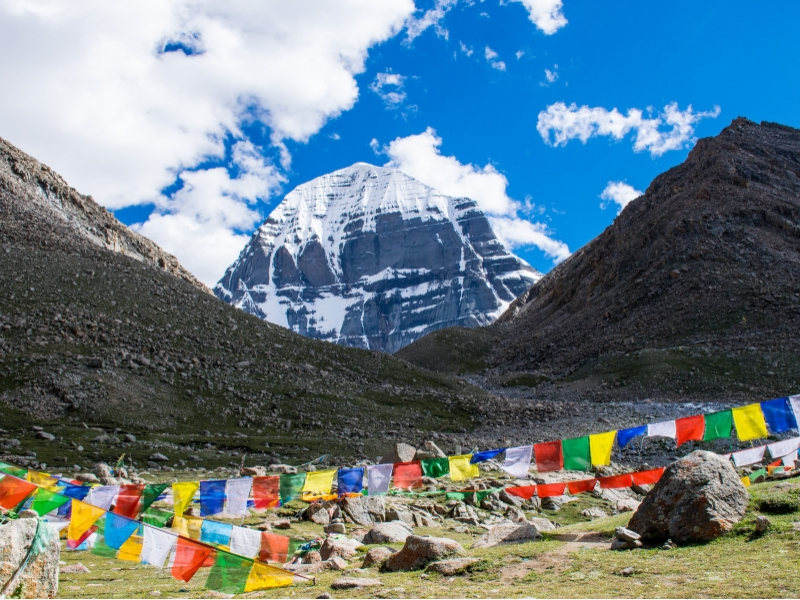 Considered sacred by Hindus, Buddhists, Jains and the followers of an ancient, indigenous religion called Bon, the 21778-feet high Mount Kailash is located roughly a 100 km from the India-Nepal-Tibet tri-border. For Hindus, Kailash is the seat of Shiva, from where the sacred river Ganges descends from heaven. In Buddhism, Kailash is the mystic image of Meru, the great mountain at the center of the universe. It is believed that a single parikrama of Mount Kailash washes away the sins of a lifetime, while 108 parikramas will achieve salvation/nirvana. 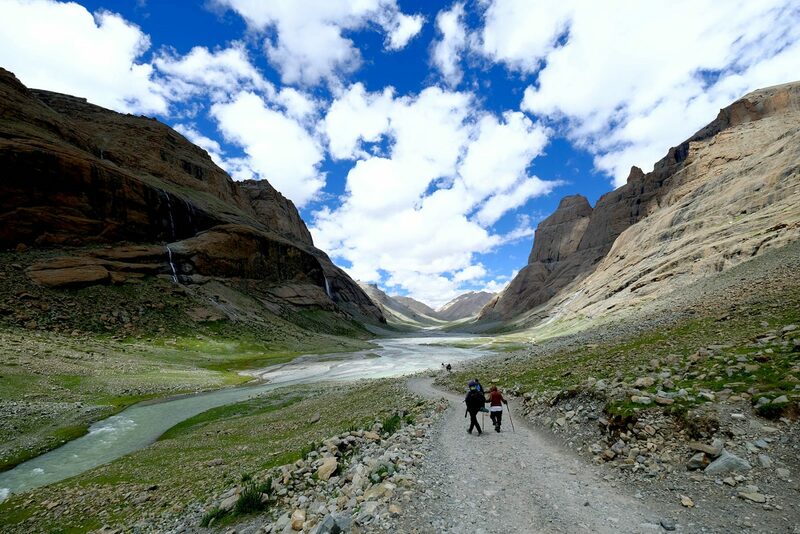 The yatra is not only considered among the most sacred, but also one of the toughest. 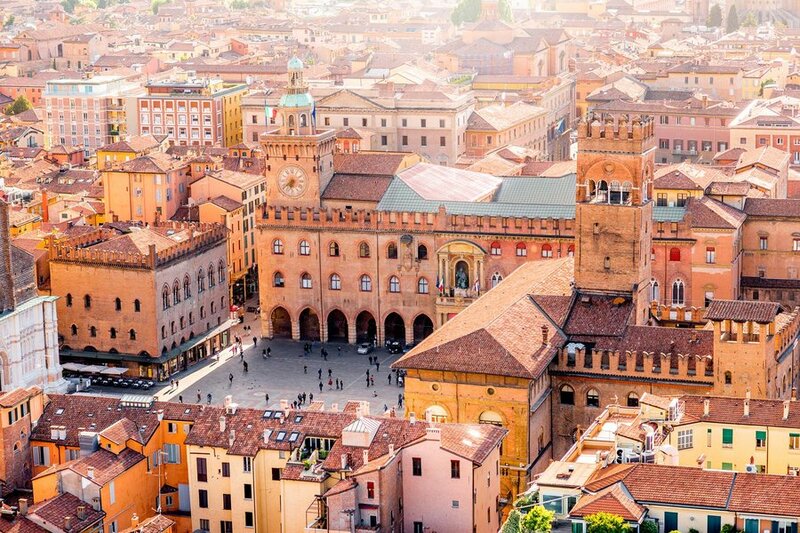 I was blessed to have undertaken this pilgrimage – an experience of a lifetime. Traveling with a couple of friends, I took the route through Kathmandu instead of the one via Uttaranchal. The journey from Nepal is routed straight to Tibet and does not entail extensive trekking. 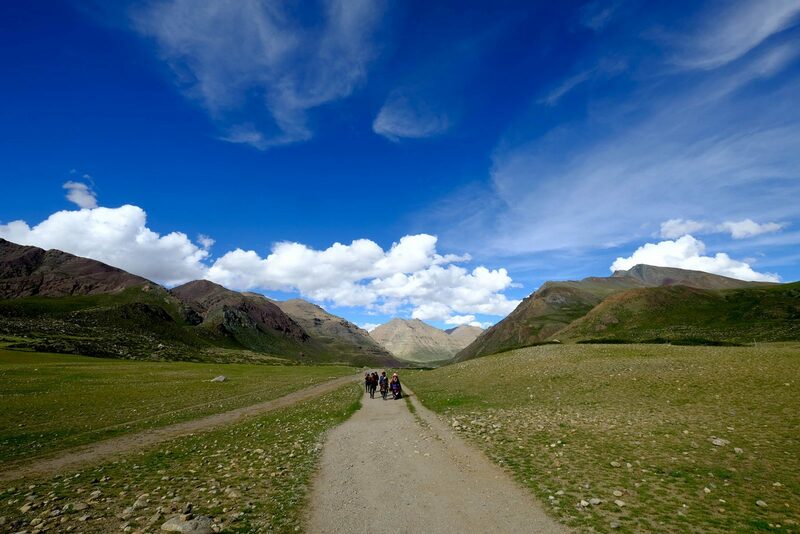 In Tibet, travel is undertaken in Land Cruisers, with trekking limited to the three days of the Kailash parikrama/ kora. Tibet is a fascinating land steeped in religion and tradition. Its remoteness strikes you immediately on crossing the border. One rarely encounters people. The highest plateau in the world, Tibet can be chillingly cold and oppressively hot on the same day. Sunlight is intense and scorching at this altitude, under clear skies and thin air. Add to this the dust and swirling cold winds, and the going gets difficult. As they say, when in Tibet, expect the worst and hope for the best. Our trip began with a bus journey from Kathmandu to the Nepal-China border at Kodari. We switched to Land Cruisers for the Tibet’s leg, driving through the most breathtaking terrain, with solitude as company. The Tibetan plateau stretches to the horizon and offers amazing sights of arid land, streams, lakes, rivers, and mountains, all vying for attention. Struggling with altitude sickness, we worked our cameras overtime to capture nature at her most awe-inspiring. 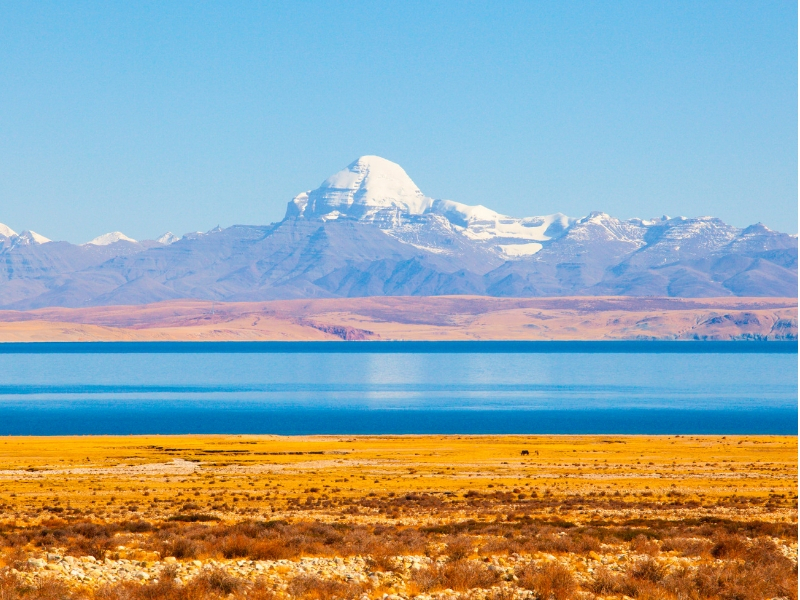 The name Manasarovar derives from the Sanskrit word manas (mind) and legend has it that the lake was first created in the mind of Lord Brahma, after which it manifested on Earth. Surrounded by majestic mountains including the Gurla-Mandata range and Mount Kailash, the lake is a tranquil blue against a strikingly blue sky. We settled into tents pitched nearby. It is believed that the Gods come down to bathe in the lake in the predawn hours. We rose early and headed for the shore in anticipation. With no visible terrestrial light, the sky blazed in all its starry glory. At some point, flashes of light appeared in the sky, slowly at first, then with increasing frequency, descending to the surface of the lake – as if a galaxy of stars had come down for a dip. It was an incredible sight! Later in the morning, we took a dip in the sacred waters before embarking on a jeep parikrama. The lake has different hues; rich turquoise at some places, a deep peacock blue elsewhere. We then headed to Darchen, the base camp for the Kailash kora. In the normal course, it takes three days to perform the 55-km kora. Tibetans do it anti clockwise, in the belief that you could meet the Gods, who do the kora clockwise. The first day entailed a 15-km, fairly easy trek to our campsite. To our right, the west face of Kailash loomed almost overhead, gazing down on the valley. And to the left flowed the Brahmaputra; a narrow stream at that point. The mountains stretched on either side, sometimes a little grassy, mostly brown, and slate black at times. The second day of the kora was the toughest, when – at 19500 feet – Dolma La, had to be crossed. Negotiating the steep inclines and boulder-strewn stretches, progress was slow. Shivasthal lay on the way. Tibetans consider this place sacred and believe that if you leave behind some of your old belongings here, you actually cast off your sins. Each step was tough; however, all was forgotten on reaching the pass. An assembly of stones adorned by colorful prayer flags, chortens are Buddhist shrines and a familiar sight in Tibet, particularly at passes. There was one at Dolma La too. As a mark of respect and to pray for a safe passage, drivers drive around them before bringing their vehicle to a halt. While crossing Dolma La, we got a view of Gauri Kund pond. It is believed that Parvati performed penance for the hand of Lord Shiva, by standing in this pond for six months. The descent after Domla La is steep and strewn with large boulders. The harsh conditions were aggravated by a hailstorm, making progress challenging. The third day was an even-paced walk with some strenuous climbs and descents towards the end. But there were some wonderful sights, including one of Rakshas Tal. Located west of Mansarovar but not considered sacred, pilgrims do not bathe in it, nor drink its waters. It is believed that Ravana, the king of Lanka performed penance here to please Lord Shiva. Our pilgrimage had drawn to a close. Another four days of travel brought us back to Kathmandu. 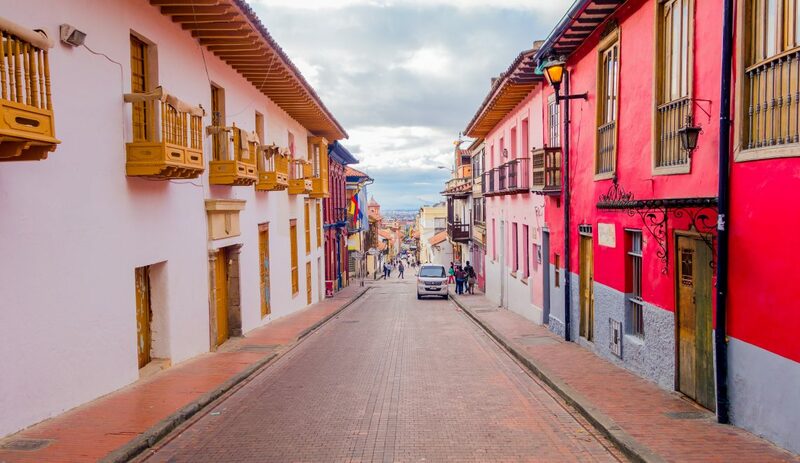 Altitude-related sickness, sleeplessness, loss of appetite and breathlessness had been but a small price for the transformation we had undergone. Tibet had changed us. For a lifetime, or more!